“A few weeks ago I had a meal with some friends. It wasn’t as posh as it sounds. It involved a take away, some cans of that bloomin’ fabulous Rhubarb and Ginger Gin stuff (served in wine glasses, I’ll have you know) … and a good old blether about our holiday adventures. One of my lovely girly pals had spent a bit of time at her sister’s house down south. She and her sister had been out with the kids during the day, and when they arrived home they found, to their horror, that the field behind the house was on fire. The farmer’s son had been harvesting the crop and a spark had flown from the combine and set the field alight. The sister’s reaction was, I suppose the exact one that any of us would have given that situation. Everyone is a safe distance … So what do I need to get out of the house that’s precious to me? And not unsurprisingly she was heading for the photographs. The fire service got it all under control and no one was injured, which was great but it got me thinking. If there was something that happened and we all got out safely and we had time… What would you grab? Now I’m gonna be honest here. My Mulberry bags are pretty high up the list. I know they shouldn’t be but they kind of are. Oh the shame! But if it really came down to it, I’d be the same as my friend’s sister. It would absolutely be photographs. The down side of wanting to rescue them would be that to do so I’d have to lift a couple of laptops (current and ancient), my phone, my old phone, a few hard drives, and a couple of pen drives hiding at the back of that drawer of random crap I have in the kitchen. You’re nodding aren’t you? Cause you do the same. You have thousands of images of your kids, precious little everyday moments and snippets of their lives, on your phone. You occasionally back them up somewhere in the house, a laptop, a device, a hard drive, but truth be told they are all over the shop. Am I wrong? And then it got me thinking about the good old days. The ones before mobile phones … Yes, yes, there was a time and I know you remember it. It was a simpler time. It was a less stressful time. It was a time when you knew phone numbers by heart. You had birthdays and anniversaries and addresses programmed in your head (or at least a good chunk of them!). If you couldn’t remember the name of the actor in that TV show that you watched a few years back then it would nag the hell out of you all day because you didn’t have Google easily accessible in your back pocket. A box in your house that was stacked full to the gun’les with photographs. 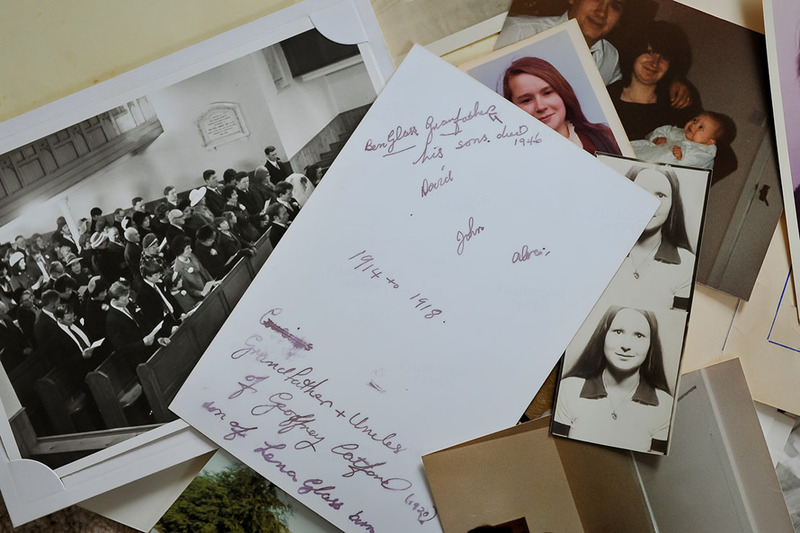 Photographs that had been saved over generations, collected together and passed down to the next generation in order that they would have a link to their past and images of faces forgotten. My mum had a box which I used to pore over as a kid. 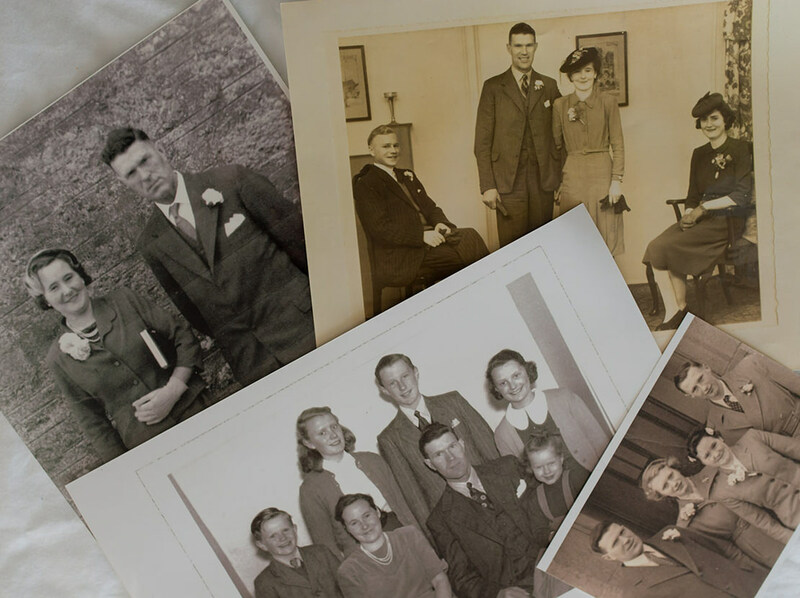 It was full of brown sepia photographs, black and white photographs with a white rim round the edge, polaroids and photographs with scrawly handwriting on the back that seemed to contain secrets. I used to get excited every time it came down from the top of the wardrobe. I used to love studying the faces in each picture, looking for features that were similar to mine or my parents. And I loved the details in the background too. What the wallpaper looked like and the carpets and the furniture. And I worry that somewhere in this ferocious technological revolution, we’ve lost some of the really simple things in life. Actually sifting through a pile of photographs that we can touch and smell and feel the different textures of and examine and get lost in. Get lost, for a few hours, in a time that we have forgotten, without once swiping across a screen. It is filled with photographs of them and photographs of us before them and pictures of me before us, and there are some less than desirable images in there of a different me in a different time, but it is, I guess, all relevant to how we ended up as our little family unit. Every single one is of interest to my kids. How true is that?! And also, how utterly sad. When you had your film camera, everything you took a picture of was printed. Do you remember how exciting it was!? Handing in a film and waiting, sometimes days, to get the results. God, the anticipation of it, usually to find that most of them were rubbish or, in my Mum’s case, missing a few limbs or a head. But in all seriousness, it’s yet another thing that’s become lost, isn’t it? 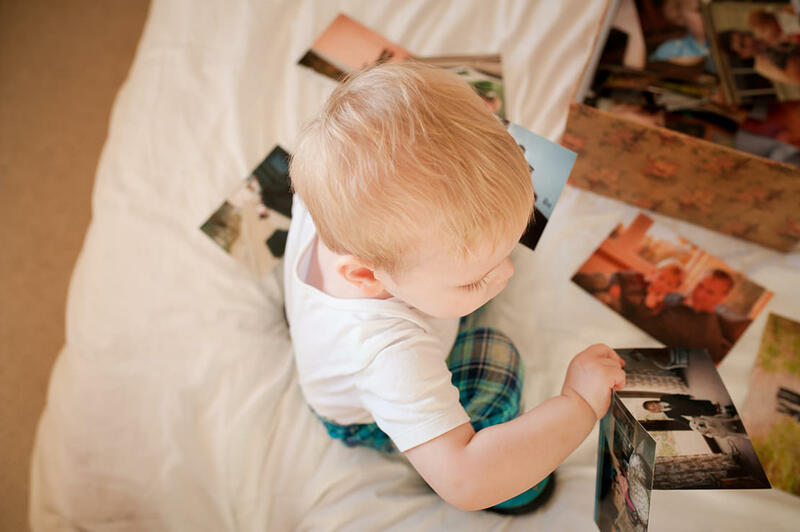 So much of our memory is linked to or enhanced by what we have pictures of. How many things do you remember from your childhood that you are able to recollect because you have a photograph of it? It’s such an important thing to do. And I guess you can just add it to the list of things along with the flippin’ enormous ironing pile, the insurance stuff that needs sorted, the forms for the school trip, the birthday gift that still needs bought. Life, especially with little people, is so incredibly busy, but … Maybe at least add it to the list? Or pop onto one of those sites that gives you free prints every month and load them up while you’re working on your laptop in the evening? It’s a job worth doing, if only so, if the worst should ever happen, you can grab your memories in one hand on the way out the door. Do you need to get a box done? Do you have a box already or do you remember the box your parents had up on the top shelf of their wardrobe? PS: Something I’d like to add to Gemma’s advice is to make sure you write the dates and people on the back of the photos. My mam did this on most of her photographs, and now she’s no longer with us to tell us these important details, I’m so grateful she took the time to do it.